The Kavos Plaza Hotel is an ideal place for the modern traveller to spend a sunshine holiday in gorgeous Kavos, Corfu, Greece. This 3-star resort welcomes guests with its serene location, quality facilities and fantastic hospitality, making it a comfortable stay. The hotel may be nestled amid lush trees, but its certainly not far from the action, at just a few minutes’ walk from Kavos beach and the bustling neon-lit strip, brimming with lively bars, restaurants and clubs. If you’re seeking an action-packed holiday to Kavos, you’ve come to the right place. 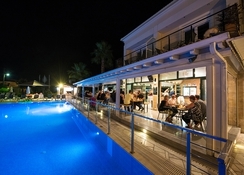 Kavos Plaza serves up two outdoor pool, both of which provide a cocktail bar and entertainment including games and competitions during the day and play music with DJ sets in the evening. 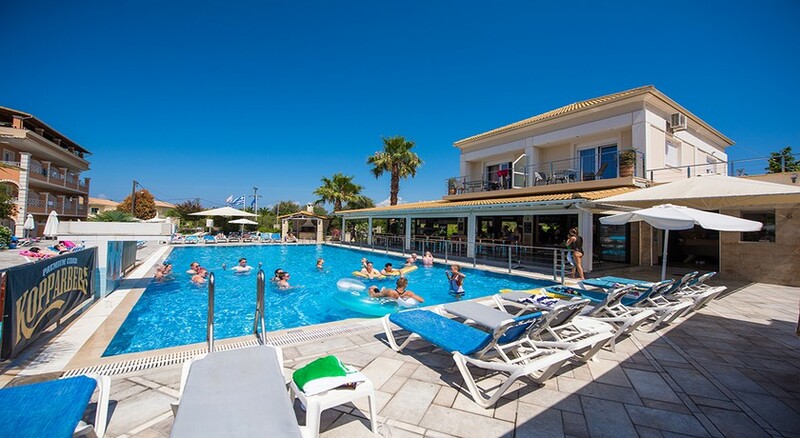 The Kavos Plaza is a self-catering resort, set up for guests to cook their own meals, however there is an on-site restaurant to indulge in (charges depend on board basis) for when hunger strikes. 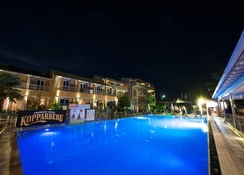 The Kavos Plaza Hotel is centrally located in the lively resort of Kavos, at the southern end of Corfu, and is a 5-minute walk to reach the nearest beach, bars, restaurants and clubs. Guests will find it easy to book flights from Kavos since there are plenty available, and the nearest airport, Corfu Airport, is only 47km from the hotel. You wont have to travel too far from your hotel to find the resorts entertainment, making it a perfect stay for upbeat groups. 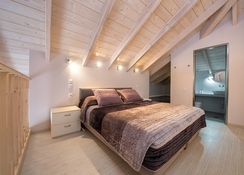 Rooms at the hotel are categorized as Suites, Triple Rooms and Double Rooms. 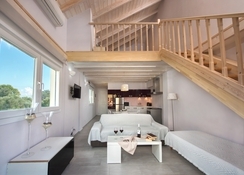 All of the rooms come with a balcony and a kitchenette. These rooms combine a blend of state-of-the-art amenities and simple décor providing a comfortable place to stay during your holiday. Twin beds, WC, Lounge and all the necessary amenities are available in the rooms. This hotel has one restaurant and a 24-hour bar, where food and drink is served throughout the day and night. If you’re returning from a late night, the bar stays open till 5am each morning, serving late-night (or should we say early!) bites such as pizza slices and hot dogs. During the day the food is served at the poolside. The Kavoz Plaza hotel not only offers great comfort, but also spectacular entertainment and facilities. There is a large outdoor pool, where you can have a relaxing swim or take part in the fun-loving games and competitions put on by the hotel staff. Additionally, there are a plenty of sun loungers dotted around the pool if sunbathing is more your thing. The cocktail bar is situated next to the pool for when guests wish to indulge, particularly when the music and DJ sets start playing in the. There is a weekly barbecue on offer to guests, too. Pets are allowed and free parking is also available. There are multiple payment options at Kavoz Plaza, including cash, bank transfer and all major debit and credit cards are accepted.